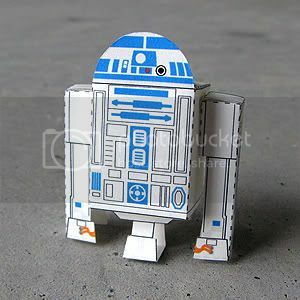 R2-D2 is a fictional character in the Star Wars universe. R2 is one of the only four characters - the other being Anakin Skywalker (Darth Vader), Obi-Wan Kenobi, and droid companion C-3PO - to appear in all six Star Wars films. What an inspired project! I look forward to checking in daily to see what's new. Thanks Amanda! You're always welcomed! OMG, THIS IS AWESOME!!!!!!!! I've always been a fan of your other work, but these are insanely cool!!!! Yoda you must make next, Hmmm! yes, i'll probably end up with all the major Star Wars characters if I pulled through the whole project! I would like to do this. But I can't find the link to download. I have not uploaded it yet. It should be up real soon! What a great idea you had ! Love those characters ! Could it be possible to do the Stargate characters ? I would love to have a collection of little Stargate cubes !!! Thanks for the suggestion. I have written it down in my notebook and will definitely consider that! Update: Free PDFs Now Available!